Our ACC Coverage has moved! Please visit us on Facebook for 2018 Tournament photos, recaps, and more! 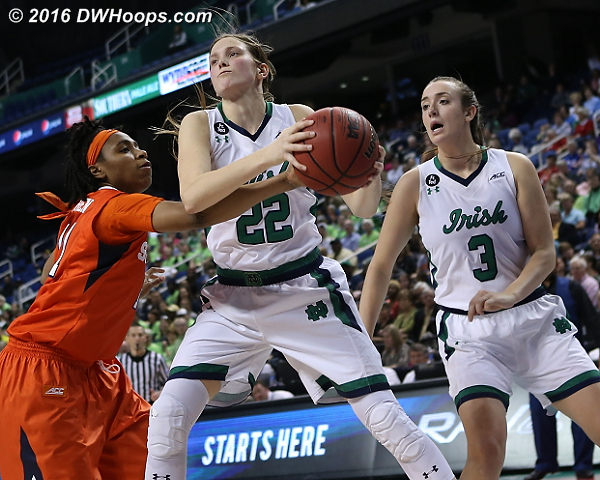 GREENSBORO -- Notre Dame used its perimeter offense and outrebounded Syracuse to win their third consecutive ACC championship 68-57 over Syracuse Sunday at the Greensboro Coliseum. 2016 Tournament Most Valuable Player Madison Cable (22, left) and teammate Brianna Turner contributed 18 points apiece, with Cable dropping in 6 three-pointers to clinch the title in what has, of late, become the Fighting Irish Invitational. The ACC Women's Basketball Digest and ACCWBBDigest.com are published by DWHoops. DWHoops is an independent media organization covering ACC Women's Basketball since 2006.
insignia and other marks of the ACC and its member institutions remain the property of their respective owners. Website Contents are Copyright � 2012-2015 DWHOOPS.COM (Orin A. Day, Durham, NC, USA. ), All Rights Reserved.